Here comes emerging virtual conference & trade show market on the wave of game changing and leveraging technology. The virtual conference and trade show market has more than doubled in a year from 2008 to 2009 and we expect a compound annual growth rate of 56% through 2015. Virtual conference technology is in its infancy today, with a few proprietary software platforms mostly targeting corporate event market. 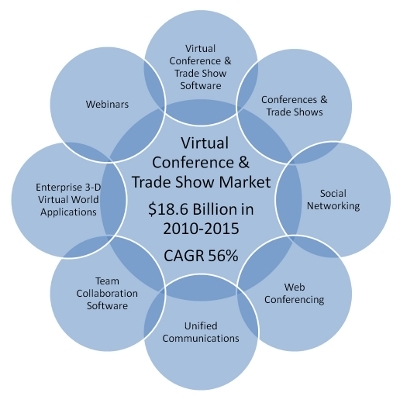 What’s going to happen in the virtual conference & trade show market in the next years? The traditional conference and trade show market will slow move the way of virtual events, and will continue to adopt virtual technology to either replace physical events where attendance is lagging or complement physical events. It is just a matter of time before the virtual events world and the trade show world merge to create the next generation of events – a hybrid of the old and the new. Why pay any attention at all to virtual event market? Will the virtual event market affect traditional conference and trade show markets? Will virtual event model compete or rather complement with traditional model? What are the key trends in software development for virtual events? What are the geographic impacts of new technology? What are market drivers and inhibitors of the virtual conference & trade show market? The report provides worldwide virtual conference & trade show market forecast for the period 2010-2015 by market segments and geographic regions.